American Woodcock are migratory. They spend the cold months in the South – the Carolinas, Georgia and northern Florida west to eastern Texas and Arkansas, concentrating in Louisiana and southwestern Mississippi. In spring, the woodcock return north. A woodcock is 10-12 inches in length (a little longer than a bobwhite quail), has a standing height of about five inches and a wingspread to 20 inches. Body conformation could be described as “chunky” – short and heavy, with a short, thick neck and a large head. Wings are short and bluntly rounded. Sexes look alike, although females generally average a bit heavier than males (7.6 vs. 6.2 oz). Weights for both sexes vary according to time of year. Sensitive nerve endings in the lower third of the bill help a woodcock locate earthworms. A special bone-muscle arrangement lets the bird open the tip of its upper bill, or mandible, while it is underground. 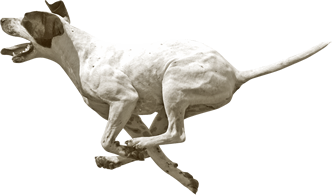 The long tongue and the underside of the mandible are rough-surfaced to grasp and pull slippery prey out of the ground. Eyes are large and set well back and high on the sides of a woodcock’s head. Naturalists have speculated that this positioning lets the bird look all around – behind, above and to the sides, as well as ahead – while it probes for food. A woodcock’s ears are ahead of the eyes, between the base of the bill and the eye sockets. Hearing and sight are acute. The woodcock’s brain is unique among birds. Its cerebellum – which controls muscle coordination and body balance – is in a ventral position, below the rest of the brain and above the spinal column. (In most birds, the cerebellum occupies the rear of the skull.) One theory suggests that as the woodcock evolved, the eyes moved back in the skull, the bill lengthened and the nostrils approached the base of the bill – adaptations which permitted ground-probing. As a result, the brain was forced back, and the mid-brain and hind brain were pushed down and slightly forward. The woodcock of today, in essence, has an upside-down brain. Earthworms, high in fat and protein, make up about 60 percent of a woodcock’s diet. An additional 30 percent is insects (ants, flies, beetles, crickets, caterpillars, grasshoppers and various larvae). Woodcock do most of their feeding in early evening and just before dawn. In spring, males establish territories known as “singing grounds.” These are woodland clearings spotted with low brush, or open fields next to brush or woods; they vary in size, but a quarter of an acre seems big enough. While on the ground, the males peent to attract females. A male will take off and fly up to 200-300 feet on twittering wings; then he’ll spiral or zig-zag back to earth, sounding a liquid, warbling song as he descends. 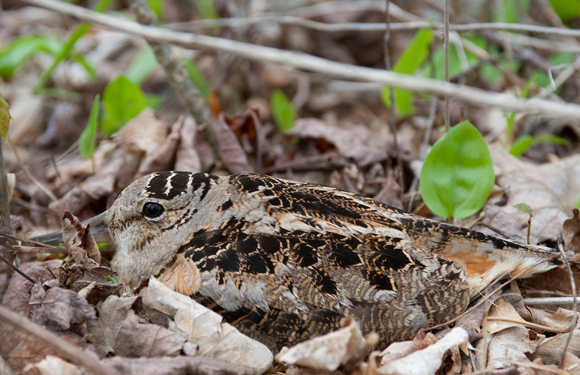 A typical woodcock nest is a slight depression on the ground in dead leaves. A female lays one egg a day until she completes the normal clutch of four. Incubation takes 19-22 days. Hens that lose their first clutch may re-nest, often laying only three eggs. Eggs split lengthwise (unique among birds) as the woodcock chicks emerge. Chicks are precocial, able to leave the nest a few hours after hatching. Chicks grow rapidly. After two weeks they can fly short distances, and at the end of four weeks they’re almost fully grown, fly strongly and look like adults. Compared to most other game birds, woodcock have a low potential productivity. A female raises only one brood each year, and each brood consists of but four (and sometimes only three) young. Fortunately, the species has a high nesting success rate (60 –75 %) and low juvenile mortality. Woodcock are attracted to moist forest land in early stages of succession. They tend to use edges rather than interiors of big, even-age thickets. Females nest and raise broods near the breeding grounds. Good cover includes edges of thickets, young conifer plantations and old brushy fields.